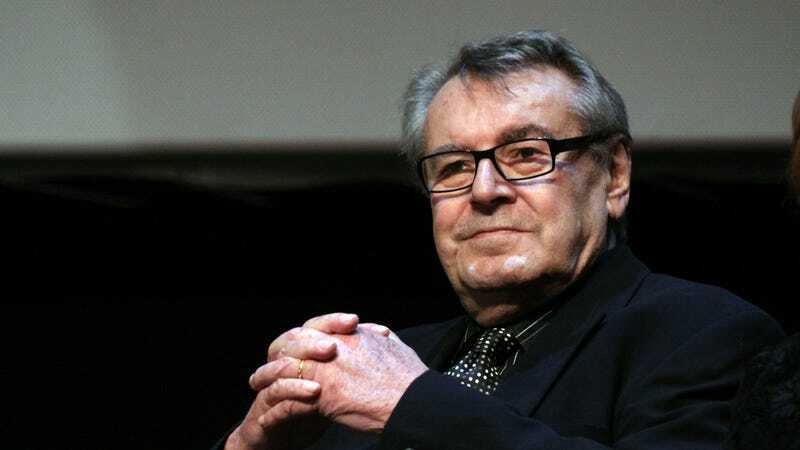 Milos Forman, whose many films about human beings refusing to be placed in the boxes society designed for them earned him both international acclaim—and the occasional scorn of audiences and governments alike—has died. Responsible for some of the most critically successful movies of the last half-century, Forman leaves behind him a filmography consistently fascinated with the rebellious archetype, whether in the form of fictional characters like One Flew Over The Cuckoo’s Nest’s Randle McMurphy or Hair’s George Berger, or real-life outsiders like Andy Kaufman and Larry Flynt. Born in what’s now the Czech Republic, Forman’s early life was dominated by the influence of totalitarian regimes; his parents were both killed in the Nazi concentration camps during World War II, and he eventually left then-Czechoslovakia, and the Czech New Wave movement of which he was a guiding light, after facing government suppression of his celebrated satirical film The Fireman’s Ball. Centered on a crew of bumbling, incompetent firefighters—and utilizing the same naturalistic camera work and casting choices that helped propel his earlier Loves Of A Blonde onto the international stage—the film was widely seen as a critique of the country’s government, which ultimately banned it from ever being shown within its borders. Refusing to rest on his success, Forman continued to pursue projects of sometimes solely personal interest, directing the 1979 musical adaptation Hair—which was swiftly disowned by the original authors, who felt Forman had cast their heroes as outsiders, rather than members of a movement—and a version of Dangerous Liaisons, Valmont, that was overshadowed by a more famous version that had been released the preceding year. In between, though, he scored his second Oscar sweep (eight awards this time, rather than a mere five) for the fantastical, lurid, beautiful Mozart “biography” Amadeus, ably transferring Peter Shaffer’s tale of 18th-century obsession and celebrity to the screen. I have to know about every word, what it means and how it goes. There must be nothing against my sensibilities, my feelings of how the structure of a scene should go, so I usually get involved very much in the development of a screenplay. I consider it half of the directing. Well, individuals fighting or rebelling against the status quo, the establishment, is good for drama. And also I feel admiration for rebels, because I lived twice in my life in totalitarian society, where most of the people feel like rebelling but don’t dare to. And I am a coward, because I didn’t dare to rebel there and go to prison for that. That’s, I guess, why I admire the rebels and make films about them.